https://matcha-jp.com/en/969 Complete Asakusa Station Guide – Get To Sensoji Temple From 4 Stations! Complete Asakusa Station Guide – Get To Sensoji Temple From 4 Stations! Asakusa is a must-visit Tokyo spot. 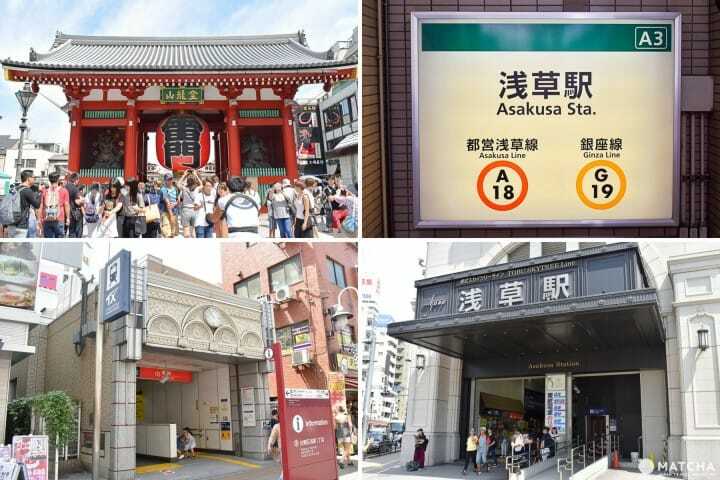 Asakusa Station is split into four different stations! We’ll introduce in detail the differences and features of each station and line along with how to access Sensoji Temple (Kaminarimon). Asakusa is a must-visit sightseeing area in Japan. There are likely many people that come to the area to see Sensoji Temple or shop at Nakamise-dori Shopping Street. Asakusa Station is the closest station to major destinations including Sensoji Temple. However, there are actually four stations that are named Asakusa Station. In this article, we’ll explain in detail the differences between the Asakusa Stations and how to get to the famous Kaminarimon of Sensoji Temple from each one! These are all referred to as Asakusa Station. Tsukuba Express Asakusa Station is the only station located a slightly further distance away and is a ten minute walk to gate of Kaminarimon at Sensoji Temple. The other three stations are a three- to five-minute distance away from the temple. Ginza Line Asakusa Station is one of the easiest stations to use. Ueno Station, Ginza Station, and Shibuya Station are located along the Ginza Line, making it convenient for access to other major stations in Tokyo. The line is marked by its yellow line color and the letter G.
If you are going to Narita, Haneda Airport or to Shinagawa, where the Tokaido Shinkansen is, then Toei Asakusa Line will be convenient for you to use. It is connected to the Ginza Line underground. The line is marked by its scarlet line color and the letter A.
Toei Asakusa Line connects to other private railways (Keisei Main Line, Keikyu Main Line). Depending on the train, the station can be used to travel to both Narita or Haneda Airport without any train transfers. If you wish to travel to Narita Airport, it will take approximately one hour to Narita Airport Station (for 1,290 yen) by the Airport Limited Express bound for Narita Airport. If heading to Haneda Airport, it will take approximately 35 minutes to reach the International Terminal Station (620 yen) by the Airport Limited Express bound for Haneda Airport International Terminal. Toei Asakusa Station is also a three minute ride (180 yen) from Oshiage Station, which is close to Tokyo Skytree. The Asakusa Line might end up leading you slightly far from Sensoji Temple if you exit out of the wrong gate. If that happens, please follow the area maps like the one pictured above. The entrance to Tobu Line Asakusa Station is on the first floor of EKIMISE. Tobu Line Asakusa Station is located inside a shopping center (pictured) called EKIMISE. Enter the center from the first floor front entrance and go up the escalator to find the ticket gates. The Tobu Line is useful for traveling to Nikko. Take the Limited Express Kegon for about one hour and 20 minutes (2,500 – 2,800 yen, varies by limited express) to Nikko. To reach to Kinugawa Onsen, take the Limited Express Kinu for about 2 hours and ten minutes (2,600-2,990 yen, will vary on the limited express). Please purchase your limited express tickets at the ticket office on the first floor. For details on tickets, refer to Tobu’s official website. http://www.tobu.co.jp/foreign/en/. The tourist information booth is also located on the first floor of Tobu Asakusa Station. You can also ask any questions you have and receive advice here too. The Asakusa Tourist Culture Information Center is also located in front of Sensoji's Kaminarimon. Tsukuba Express Asakusa Station is, as mentioned above, located slightly further away from the other stations. There may be few people that use this station for sightseeing, but you can reach Akihabara from this station in four minutes (210 yen). We will now introduce how to access Kaminarimon, located at the entrance of Sensoji Temple, from each station. This is the gate you’ll see immediately after exiting Platform 2 of the Ginza Line. The nearest exit to Kaminarimon is Exit 1. Follow the signs and go up these stairs. To the left of the stairs are elevators as well as coin lockers. If you are carrying luggage you can leave it here. Here’s what it looks like after coming out from Exit 1. Family Mart, a convenience store, will be located in front of Exit 1. Continue straight down the sidewalk to you’ll see Kaminarimon to your right after walking for about one minute. These are the ticket gates of the Toei Asakusa Line. The nearest exit to Kaminarimon is Exit A4. There are two Toei Asakusa Line gates, so be sure to head to the A4 gate. After going through the gates, follow the signs that say “A4.” Go down the stairs once while you are underground and then go upstairs once more. After walking up the stairs, Exit A4 will be on the other side. Once you’ve exited Exit A4, proceed straight to your right. After doing so, you will exit out onto a large street pictured in the background of the photo above. Turn left here and you will see Kaminarimon to your right. You can also go outside by taking the elevators from the Toei Asakusa Line. If you want to use the elevators, exit out of the other Toei Asakusa Line gates (A1, A2). Exit A2-b is the elevator. After exiting the elevator, cross the road diagonally to your right and head straight for about five minutes to arrive at Kaminarimon. The Tobu ticket gates are located on the second floor. First, exit out of the gates, then go down the stairs in front of you. There is a tourist information booth at the bottom. Walk straight outside and cross the traffic light to your right. After you’ve crossed the street, continue left. The first bar established in Japan Kamiya Bar, (written in Japanese, pictured above on the right) is at the corner. Turn right at this corner, then continue straight for two to three minutes and you’ll arrive at Kaminarimon. To get to Kaminarimon from Tsukuba Express Asakusa Station, go out Exit A1 (Kokusai Dori - International Street), then head left. Continue along the large street (Kokusai Dori) for about five minutes. Once you do so, you’ll come upon an intersection of a large street (Kaminarimon Street). Turn left here. You will see signs like the one pictured above. There will be a covered sidewalk once you’ve turned. Please continue straight down this sidewalk. You will see Kaminarimon at the side of the road (left) after walking for about five minutes. Asakusa Station is complicated due to its four stations. However, these stations are very convenient for getting to different places once you get used to them. Tokyo is filled with slightly confusing stations like Asakusa. You can ensure your travels go smoothly by gathering information on both your departure and arrival stations beforehand! Walk Above The Clouds at Tokyo SKYTREE® in Oshiage! This article is a rewritten version of an article originally published on July 19, 2015.